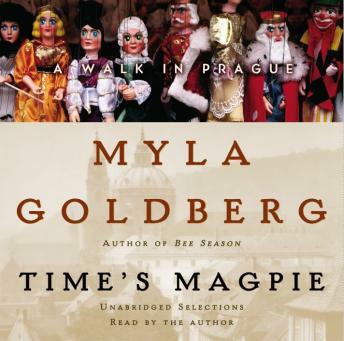 From the critically acclaimed bestselling author of Bee Season comes a travelogue through the magical and historic city of Prague - a city of vast beauty and wonderfully intimate detail. In Time's Magpie, Myla Goldberg uses her eye for the wonder of tiny objects and everyday things to put us in touch with the essence of this haunting and fantastical place. Goldberg takes us through the city's historic streets, some eerily transformed by the devastating flood of 2002; to Lunapark, home to bumper cars, go-carts, and a discomfiting array of Technicolor confections; and through Strahov Monastery, where the cabinets of curiosity display everything from butterfly specimens to a supposedly real jabberwocky. We attend an anti-war protest in Old Town square and watch the skateboarders do tricks on a ramped marble pedestal that once held a statue of Lenin.